Watch the video about how corn is grown! Nebraska corn farmers really know how to grow corn—and plenty of it. Each year, Nebraska farmers produce well over one billion bushels of high-quality corn. Nebraska is the nation’s third largest corn producer, behind only Iowa and Illinois. Corn production in terms of bushels produced by acre have increased dramatically over the years – growing from 26 bushels per acre produced in in Nebraska in the 1900s to 181 bushels per acre produced in the state in 2017. Nationally, the numbers are similar, with corn yields across the country averaging nearly 176.6 bushels per acre in 2017, resulting in a 14.6 billion-bushel corn crop in the U.S. Irrigation is one reason Nebraska is able to consistently produce high volumes of corn. Nebraska has more irrigated corn acres than any other state, thanks in large part to the Ogallala Aquifer—a large underground water supply that lies beneath much of the state. No state is better situated with corn, livestock and ethanol than Nebraska. 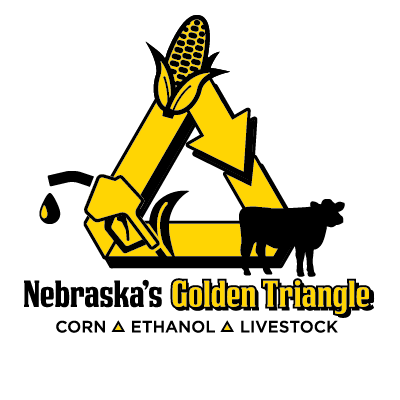 This combination is known as “Nebraska’s Golden Triangle.” Nebraska is the third-largest producer of corn in the country, second in ethanol production and distillers grains (the feed ingredient produced by ethanol plants), second in cow-calf production and first in cattle on feed. It’s also an important location for the production of renewable corn-based polymers (bioplastics). This means corn farmers have solid markets for corn – ethanol and livestock – while the two dozen ethanol plants across state then provide renewable fuel and a feed ingredient for the livestock industry. This gives cattle feeders in Nebraska more feed options and an advantage over feeders in other states. The cattle sector then provides high-quality, corn-fed beef to people across town, throughout the country and around the world. In essence, Nebraska’s Golden Triangle is a perfect way to add value to corn – via a renewable biofuel, distillers grains and meat production – all within Nebraska’s borders, providing an incredible economic engine for the state. 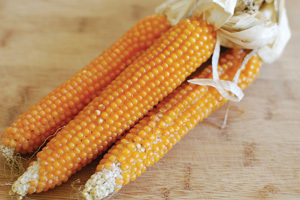 Watch the video on the different types of corn! More than 99% of the corn grown in Nebraska is field corn, which is typically fed to livestock or processed into ethanol. Field corn is grown until it is hard and dry, and then is harvested in the fall. 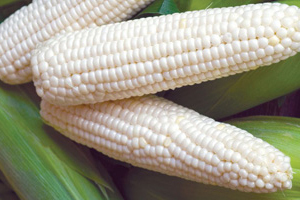 Field corn is sometimes called “dent corn” because of the distinctive dent that forms on the kernel as the corn dries. Field corn is consumed by livestock (primarily cattle) or processed into ethanol and its animal feed co-product called “distillers grains.” Field corn is NOT the corn-on-the-cob or the canned corn that people eat. That type of corn is called sweet corn. while many Nebraska farmers do grow some sweet corn, the acres and acres of field corn you see across the state are likely field corn, making Nebraska the nation’s third largest corn producer. 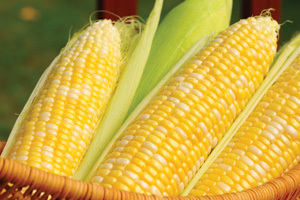 Sweet corn is bred to have plump, juicy kernels that include a high level of natural sugar when compared to field corn. It’s that sugar that gives sweet corn the flavor we all love. 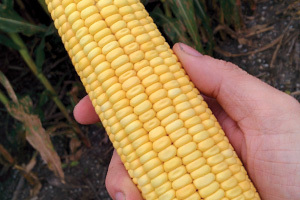 While field corn is harvested when mature and dry (so it can be transported and stored), sweet corn is harvested when the kernels are young and moist. Nebraska is the nation’s largest producer of popcorn, with an annual harvest of 300 million pounds on about 67,000 acres. Each kernel of popcorn contains a small amount of water stored inside a circle of soft starch. When the kernel heats up in the microwave, air popper or on the stove, the water expands until the kernel bursts open to create a light, delicious snack. Americans consume 16 billion quarts of popped popcorn annually – that’s 51 quarts per every man, woman and child! 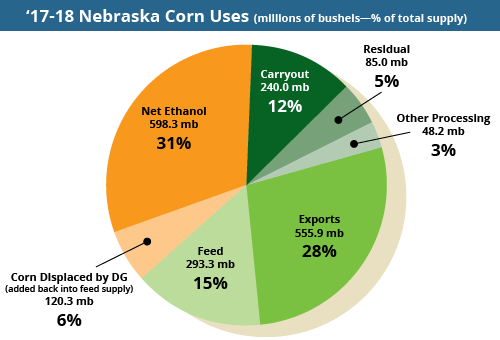 Much of the corn Nebraska farmers produce stays in Nebraska through ethanol, livestock and other processing. By using more Nebraska corn in Nebraska, we’re capturing more of the corn’s value right here in the state. That’s good for the state’s economy, rural communities and Nebraska corn farmers. Because Nebraska corn farmers are so efficient, more corn is produced than is used by the state, which means some is exported to ensure a healthy trade economy. The pie chart shows a further estimated breakdown of usage. Whether you’re looking for more information for a research paper or simply to find something fun to do, the links below lead to a wide variety of websites that should be helpful. History of Corn – Corn has been part of Nebraska’s history for more than a thousand years! 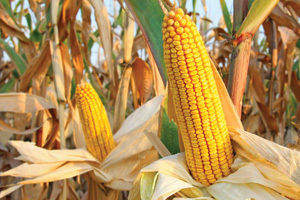 Can Corn Fuel the Future? (YouTube playlist) – YES! Corn can fuel many different things. It can make ethanol that fuels your car, feed that fuels the diets of livestock and can be used to fuel the development of new products made from corn.